Autofill or autocomplete is a feature of most modern internet browsers that makes filling out forms easier by saving the information that you have used to fill out forms in the past, and making that information easily available to enter into new forms with similar text fields. Autofill selections usually appear as a drop-down list of options when you double-click on a field in an entry form or they appear already filled when the form opens. If you enter sweepstakes or need to fill out forms on websites, autofill can save you time by reducing the amount of typing you need to do, replacing the need for a form-filling program like Roboform. However, unwanted autofill suggestions can build up over time. Perhaps you made a typo when you entered your name one time, or you moved and have a new address now, or you filled out a form for a friend or relative once upon a time. Now those useless autofill suggestions keep appearing when you fill out new forms. To get rid of unnecessary autofill choices in Chrome, highlight the suggestion you want to clear by hovering your mouse over it, then press the "shift" and "delete" keys at the same time. If you want to delete all of your autofill entries and start over with a clean slate, you can click on the "hamburger button" at the top right-hand side of your screen (it looks like three lines stacked on top of each other), click on the "Clear Browsing Data..." button, and make sure that the "Autofill form data" checkbox is selected before clearing the data. To delete individual autofill suggestions in Internet Explorer, double-click the text field so the drop-down box of autofill options appears, then hold your mouse over the option that you want to remove from autofill so that it's highlighted. Don't click on it. 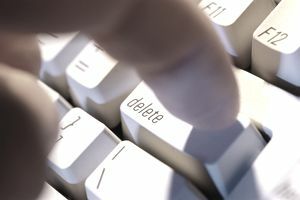 Finally, press the delete key on your keyboard. The unwanted suggestion should be cleared from your autofill results. If you'd like to remove all of your autofill suggestions, click on the "Tools" icon at the top right-hand side of your screen, then select "Internet Options" and pick the "Content" tab. Then look for the AutoComplete section and click on "Settings." At the bottom of that section, there is an option to "Delete AutoComplete History." You can choose whether you want to delete forms, passwords, or both. Open "Settings" by clicking on the three dots icon and selecting it from the menu. Scroll down to "Clear Browsing Data" and select "Choose What to Clear." Select "Form Data" and click the "Clear" button. To clear individual autocomplete suggestions in MS Edge, click on "Settings" at the upper right-hand corner of the screen, then "View Advanced Settings," then "Manage My Saved Passwords." This will bring up a list of autocomplete information and you can delete individual entries to remove typos and other unwanted suggestions. As with Chrome, if you want to delete individual autofill suggestions in Firefox, highlight the suggestion you don't want to receive any more and press the "shift" and "delete" keys at the same time. If you want to delete all of your autocomplete information in Firefox, click on the hamburger button, select "History" and then "Clear Recent History." Make sure that the option for "Form & Search History" has been selected and that the time range is set to "Everything" before confirming. Start by opening the Opera menu at the top left-hand side of your screen, and then clicking on "Settings." Look for the "Autofill" section, and then select "Manage Autofill Settings." From there you can edit individual entries or disable the autocomplete option altogether. Keeping your autofill data clear and up-to-date will help you fill out forms faster and prevent you from accidentally selecting the wrong information.